Jeff Trandahl, the gay former clerk of the U.S. House of Representatives, has ended his public silence on the page scandal that led to Republican congressman Mark Foley’s resignation last September. Trandahl told an audience of about 250 gays and lesbians that he had “dozens” of confrontations with Foley over the years in an effort to persuade the then representative from Florida to stop making improper advances toward House pages. Trandahl gave a brief account of his interactions with Foley during a gay rights panel discussion that took place May 31 on board the Queen Mary 2 in its first all-gay trans-Atlantic crossing. Foley resigned from Congress, came out as gay and entered a rehab facility after sexually explicit text messages he sent to male teenagers surfaced in the news. The teenagers were between the ages of 16 and 19 and had recently completed assignments as House pages, according to findings of an investigation by the House Committee on Standards of Official Conduct, sometimes known as the House Ethics Committee. The committee found that Foley began sending solicitous but non-sexually explicit e-mails to the teens while they were still pages, an action it called a breach of proper behavior that could have led to disciplinary action had Foley not resigned. The Florida Attorney General’s office and the FBI continue to investigate Foley for possible criminal charges under Florida law in connection with his alleged sexually explicit messages to former pages through the Internet. As House clerk from 1998 through November 2005, Trandahl had oversight authority over the page program. Investigators with the House ethics committee have said Trandahl repeatedly urged staff members of House GOP leaders to rein in Foley’s inappropriate behavior. In a separate development, Justice Department investigators on June 5 informed former U.S. Rep. Jim Kolbe (R-Ariz.), who is gay, that they found no wrongdoing in an “inquiry” into allegations that Kolbe had inappropriate relationships with House pages, Kolbe’s attorneys said. “We were informed yesterday afternoon that the Department of Justice has completed its preliminary inquiry into allegations relating to former Congressman Jim Kolbe and has declined further investigation,” attorneys Reginald Brown and Brent Gurney said in a June 6 statement. Kolbe became linked to the page scandal last October when NBC News reported that federal prosecutors were looking into allegations that he acted inappropriately with a 17-year-old former page during a July 1996 camping trip that Kolbe organized at the Grand Canyon in Arizona. NBC News quoted an unnamed participant in the camping trip as saying that Kolbe exhibited a lot of “fawning, petting and touching” on the arms, shoulders and back of the 17-year-old. Kolbe denied he acted inappropriately toward the teenager and others participating in the Grand Canyon outing, including Kolbe’s sister, who insisted Kolbe acted like a “gentleman” at all times and never engaged in improper behavior. 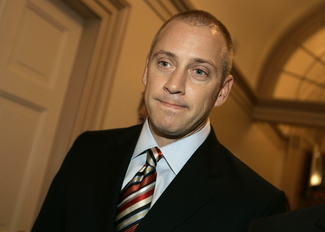 Kolbe, 64, was the only openly gay Republican member of Congress. He announced before allegations surrounding the camping trip surfaced that he would not seek election to another term and would retire from Congress at the end of 2006. He now works as a fellow at the German Marshall Fund think tank and serves as a consultant with former Secretary of State Henry Kissinger’s consulting group on issues related to trade, U.S. foreign aid and immigration. His attorneys said Kolbe would have no further comment beyond his written statement. Trandahl told the Queen Mary 2 audience that he opposes outing public officials, but said that it is important for gays and lesbians to be out at work. Trandahl also criticized mainstream media coverage of the Foley scandal, saying he was demonized in some accounts. Trandahl, a Republican, now holds the post of executive director of the National Fish & Wildlife Foundation and is on the Human Rights Campaign board. Trandahl and his spokesperson, John Butler, a former officer with the Gay & Lesbian Activists Alliance of Washington, have declined to comment on anything associated with the Foley matter since the scandal broke last year. Trandahl resigned from his position as House clerk and announced his new job in the fall of 2005, shortly after he began questioning Foley’s behavior toward pages in private conversations with both Foley and House GOP staffers. In his remarks on the Queen Mary 2, he refuted speculation that GOP leaders forced him out of his job. He said he had long planned to retire from his House clerk’s job after 20 years of government service and noted that his departure was set well before the scandal broke. Trandahl thanked former House Speakers Dennis Hastert (R-Ill.) and Newt Gingrich (R-Ga.) and current Speaker Nancy Pelosi (D-Calif.) for supporting him during his tenure in the House. But he said former House Majority Leader Tom DeLay (R-Texas) had long sought to oust him from his job as clerk because he is openly gay. A spokesperson for DeLay disputed this assertion, calling it a “serious accusation and an outright lie,” according to the Capitol Hill newspaper Roll Call. National Review, a conservative magazine, said another source — an unnamed former staffer for the House GOP leadership — also expressed skepticism over Trandahl’s claim that DeLay wanted him fired. “No member of Congress has a worse gaydar than Tom DeLay,” National Review quoted the former staffer as saying. Trandahl’s remarks on the Queen Mary 2 were brief and came after an audience member asked a question about Foley. The panel discussion addressed the question of how far the gay rights movement has progressed.